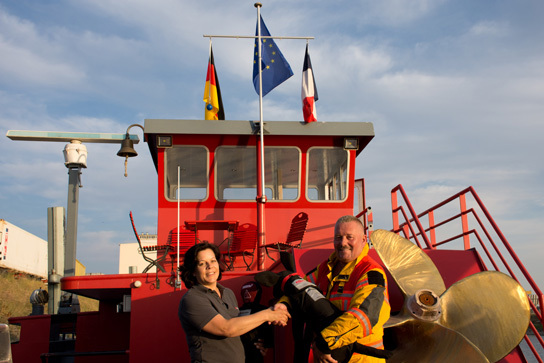 Sunny weather contributed to the joy of the team around Lieutenant Thierry Romilly. A training dog and a training baby dummy will make training even more realistic in the future. rescue-tec is pleased that the two will be used in the recently expanded training area, e.g. to simulate emergency situations on passenger ships. The MÜB is a mobile training facility on a former tanker. With an area of 1,500 m² it offers realistic training at the highest level. 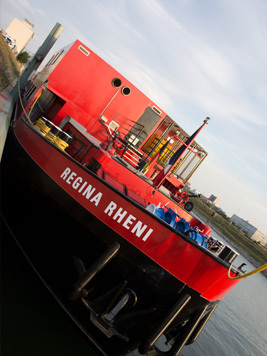 The scenarios are almost inexhaustible, from fire fighting on all parts of an inland vessel, tank leaks and water inrushes to use in unstable sea containers. And of course, a fire training and a respiratory protection training system are integrated. After 5 years of project work by a Franco-German team, this innovative system was put into operation. It was developed in cooperation with fire brigades of the French departments Bas-Rhin and Haut-Rhin as well as Baden-Württemberg and Rhineland-Palatinate. 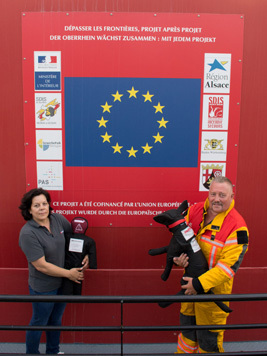 In addition, the project was technically supported by Hesse and the Basel-Stadt fire brigade (Switzerland). Due to the cross-border dimensions, also with regard to hazard prevention, this special project was supported by the EU. The MÜB is located alternately at berths in Strasbourg and Mühlhausen (France) as well as in Mannheim. Exercises on the MÜB can not only be carried out by the participating units. The facility is open to all aid organisations for booking exercises. From short 4 hour units up to seminars lasting several days, almost every wish can be fulfilled. Simply contact us at www.crerf-mueb.eu. You cannot practice many scenarios more realistically.